If Monty Python's Spamalot and Mel Brooks' Robin Hood: Men in Tights had an illegitimate child, it would be named Galavant. The new ABC show's imagined parentage is a good thing, really. At least... for people like me, it is. People like me who love witty, absurd comedy. People like me who love silly humor and musicals. I love Spamalot's "Song That Goes Like This." I love that movies like Robin Hood: Men in Tights and The Princess Bride and Monty Python and the Holy Grail contain a lot of meta humor. And the reason why I love meta humor (why shows like Psych and Community are among my favorites) is because meta humor makes an audience feel like they're a part of the joke and, consequently, like they're a real part of the series or movie as well. Admittedly, when Galavant first began to run sneak peeks and promos, I scoffed because no show on television has really been brave enough to tackle the kind of humor I mentioned above and certainly no show has been brave enough to set it to music, as well. But as I saw more and more commercials (and finished my marathon of Psych, desperate for more Timothy Omundson in my life), I began to warm toward the idea of the series and instead of finding the prospect of a meta-humor musical parody on ABC irritating, I found it welcome. Refreshing, even, for the network. Network television is no stranger to musical series or specials. NBC had massive success with The Sound of Music: Live! (no one told the network that most people hate-watched it, did they?) and followed up the special event with Peter Pan: Live! late in 2014. Glee found huge success on FOX until recent years when the Nielsen numbers began to sharply decline. Television isn't afraid to make itself musical. It's afraid to make itself musical and bold. The reason why nearly everything from Monty Python has become iconic is because those movies and musicals and sketches weren't afraid to be brave and to be absurd and to be downright stupid, at times. They're iconic because they tap into the parts of human beings that adore acting like idiots and think that other people acting occasionally like idiots is funny. When comedy takes itself too seriously, it places itself into a box. Boxes are constricting and they're good for a while. But they're safe. When you look at Spamalot and Robin Hood: Men in Tights and Monty Python and now Galavant, you laugh. You cannot help but laugh. And sure, you probably roll your eyes slightly and maybe you snicker instead of belly-laugh, but this kind of comedy is occasionally what we need, as humans. We need to laugh at how absurd musicals are while still being IN one. We need to see a lovely maiden act like a complete and total bee-yotch to her pushover king husband. We need to have running gags and meta commentary because we NEED to be absurd every now and then. And Galavant reminds us that it's not just okay to be absurd -- it's actually FUNNY. All of the television series and musicals and movies I noted above are absurd. I mean, Monty Python and the Holy Grail has an entire sequence about a killer bunny rabbit, guys. But there's a very important reason as to why absurd comedy works and why it becomes iconic: it needs to also genuinely be smart, at its core. That may appear to contradict what I said above, about comedy never taking itself too seriously, but make no mistake about it: absurd, genuinely intelligent comedies that tap into what makes it funny to be a human being or what makes it funny to watch a musical get remembered. They become iconic. Absurd, stupid comedies -- ones that don't understand WHY characters or situations are funny and instead try to insist they are... just because -- get forgotten and deserve to be. At its heart, The Princess Bride was a comedy of absurdity and yet it was not stupid. It was extremely smart. It had witty rapport between its characters. It had a genuine story. It connected with viewers because though it was fantastical, we understood why situations were funny. The movie wasn't realistic in a lot of aspects, but the humor tapped into something very much human within each of us. And that's why it remains a classic: it's a comedy that notes the absurdity in the world (in this case, in fairytales) and makes fun of it while also shedding light onto why we laugh. Furthermore, The Princess Bride is layered. It doesn't box itself into being a "just": it's not JUST a comedy. It's a love story. It has substance. And that brings us back to Galavant, which I adored. I found the first two episodes to be exceptionally funny and also endearing. Its music was absolutely fantastic and though the pilot was a bit clunky in points, the second episode -- "Joust Friends" -- was a significant improvement. 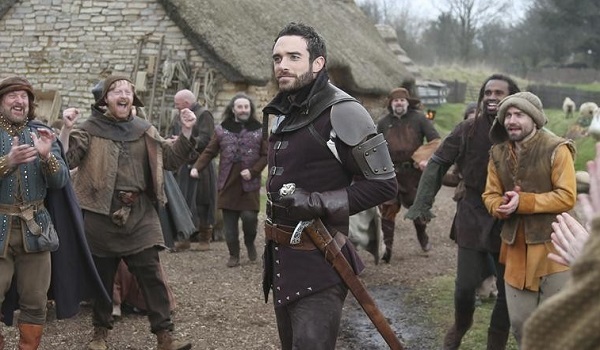 Galavant is the story of a hero named, well, Galavant. He and a lovely (but rather hot-tempered and spiteful as we will see later on) maiden Madalena that was kidnapped by King George. And when Galavant valiantly rescued his true love... she made the very conscious and very humiliating decision to stay with the king and accept her life of riches and royalty (and ease) over a life with Galavant. This, understandably, broke our hero and he returned to his home utterly destitute and remained there, essentially in filth and drunkenness. What makes Galavant, already, such an enjoyable series is that it doesn't dwell too long on the sentimentality (when Isabella tries to encourage Galavant to help her, the latter explains his backstory -- about how he grew up with parents who said they loved each other and fought incessantly, so he swore off the idea of love or falling in love), but also acknowledges that sentiment is part of a hero's journey. The inherent problem that I have with comedies is that occasionally they sacrifice story for the sake of a joke. And what happens when writers do that -- when they dwell too long on a pun or riff -- is exactly that. Shows become punchlines and moments become brushed-off jokes. But what I love about the first two episodes of Galavant is that there were a few actual emotional moments amid the hilarity. Additionally, the series is intriguing for me because there are compelling and diverse characters that are re-working tropes (Isabella as a duplicitous princess who can also fight; Galavant as a semi-reluctant and not entirely physically capable hero; King Richard as a giant sensitive man-child king; Madalena as an unassumingly beautiful maiden with a sharp tongue; Gareth as the gruff but hilariously astute "henchmen;" and Sid as the sarcastic, realistic sidekick) and also because I'm genuinely interested in this hero's journey. If you're wondering why we keep returning to this kind of comedy -- why people still find meta humor enjoyable, why they like it when people randomly burst into song, and why slapstick and silly humor can still make us giggle -- I think it's really and truly because there is a part of us that loves being entertained. We love seeing stories we know (the hero's journey, rescuing the princess, a castle-wide dance number!) over and over again in new ways. We love watching pieces that shouldn't fit together -- like singing and dancing kings or duets sung on horseback -- really work for us. We like being silly, but more importantly, we like having FUN. And if you're looking for something to liven your Sunday nights for the next few weeks and take your mind off the Monday blues that will inevitably occur when you return to work the following day, then look no further than Galavant. Did I mention how much I enjoyed seeing Timothy Omundson back on my screen? I did. I totally and completely did. Fun fact: Scott Weinger is credited as a supervising producer on the series. You probably know him as the voice of Aladdin. I know him as Steve from Full House. "Of course, we're doing to open some presents, but then we're going to do it!" "Got it." I loved that the series revamped all of the ABC in-house promos and set them to the tune of the opening theme. I know some people were annoyed by it, but come on. I would totally make an effort to watch Resurrection if it had singing and dancing in it, wouldn't you? "I swear, it's the plague." "It's not the plague." "TOTALLY empathize. TOTALLY understand. ... Can I have it?" "If he finds out I'm working for the king --" "........ Wait, what?" "Holy *bleep,* I'm out of shape. Oww, my tummy. That was a long song!" I died laughing at this. True story. "Can we swap horses? Yours looks softer." John Stamos was the first of numerous guest stars and his appearance made me so happy. ALSO his name was Jean Hamm. JEAN HAMM. "Oh, poop. I got gravy on my tummy flowers." Omundson for all of the awards, please and thank you. "It's 1256. The 'yo mama' jokes are getting really old." "... YO MAMA IS REALLY OLD." "Seriously, Jean..."
"He's the lord of the..." "Sword?" "... Sorry, no. I can't." "How did you get on the horse?" "I slept on the horse." The slowest joust in history earned the biggest laughs all evening from me. It was perfect. It'll be hard to top "Maybe You're Not the Worst Thing Ever" as the best song in Galavant. It really will because that was perfect.